In France, Drivers Face Gas Prices Of $8 A Gallon : The Two-Way Prices for gasoline are hitting record highs in France, where a gallon now costs more than $8 in some areas. Here in the U.S., analysts are predicting high gas prices for American drivers this summer — more than $4 in many areas, from a current average of $3.52. 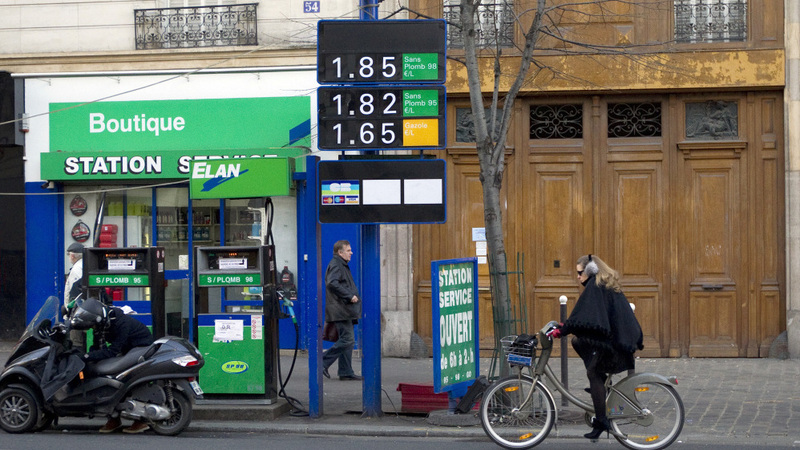 Gas prices in France have topped more than $8 a gallon in some areas. In this photo from January, a woman rides her bike past a gas station in Paris. "Prices are up because of problems with two of France's main oil suppliers. Nigeria is racked by civil unrest, and European Union sanctions bar France from importing oil from Iran." "A lower euro has also raised the price of gasoline because crude oil prices are denominated in dollars." "The head of Total, France's largest oil company, said he could not exclude prices going as high as 2 euros a liter — or more than $10 a gallon. Total says the only way to bring prices down is to find more sources of oil." Prices of diesel fuel have stayed below prices for gasoline, according to Le Monde. A liter of premium unleaded (98 octane) goes for around 1.62 euros, on average, while a liter of diesel is currently at 1.41 euros. With a presidential campaign under way in France, the issue of how much it takes to fill the tank is emerging as a political issue. "Front-running socialist candidate Francois Hollande suggested a temporary freeze of pump prices," Eleanor notes, "but President Nicolas Sarkozy's party immediately shot down that idea, calling it passé." If that sounds familiar to you, it should. As ABC News reports, here in the U.S., analysts are predicting high gas prices for American drivers this summer — more than $4 in many areas, from a current average of $3.52. The last time we saw prices in the $4 range? That was in the summer of 2008, also a presidential election year.